Inga Enna Solluthu Dialogue uttered by Ganesh in VTV became popular and people started calling him as ‘VTV’ Ganesh. He has written the script for this movie and has produced it. He also has played the lead role in this movie. Presence of Santhanam & guest appearance of Simbu & Andrea have raised some expectation of this movie as people believe that it will be a laugh riot. Let us see whether it will satisfy COMMON MAN in this review. 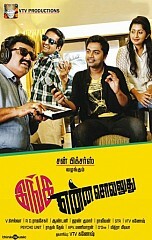 Story: VTV Ganesh informs about his first job, love & marriage to the driver Santhanam while travelling back to Chennai. VTV Ganesh – People like him for his voice and hence, they enjoy his comedy scenes. But, in this movie, he has done the lead role and he will be unable to satisfy the audience with his acting skills. The whole movie revolves around him and he couldn’t deliver it properly. Meera Jasmine – National Award Winning Actress makes a comeback to Tamil Cinema with one of the weakest script. Her characterization was poor and she doesn’t even have one scene to show her acting skills. Santhanam – Santhanam has more screen presence in the first half and comes in just 2 – 3 scenes in the second half. His one-liners were quite good in few scenes alone. Music by Dharan was quite good. Appatucker & Kuttipayale song was good. But, having 5 – 6 songs in a movie without leading hero is a huge mistake. Cinematography by Rajasekhar was average too. Movie runs for 2 hours and 10 minutes. Editor Anthony doesn’t have much opportunity to prove his skills as most of the scenes in the movie were not related. Director Vincent Siva made his debut in Tamil Cinema with Vijay’s Priyamudan. Mysskin and S. P. Jananathan have worked under him as Assistant Directors. Patience of the audience will be tested throughout the movie as there were absolutely no story, screenplay or good comedy scenes. Simbu appears in 3 – 4 scenes in the movie and those are the only scenes, which provides some relief to the audience. Santhanam teases VTV Ganesh by asking him to say a better story and criticizing his love as worst love. He also advises VTV Ganesh to learn Cinema, before entering into it. Verdict of the Common Man too remains the same. This page has information about Inga Enna Solluthu Movie Review by Common Man, Inga Enna Solluthu.